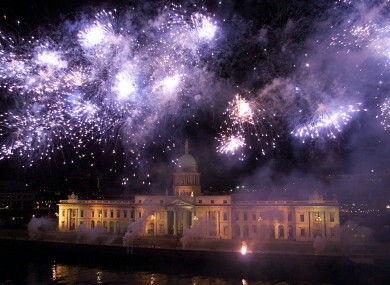 Dublin's Custom House lit up by fireworks during the St. Patrick's Day Festival in the year 2000. RENTS IN DUBLIN are now higher than they were at the peak of the housing boom. New figures from the Residential Tenancies Board show that, after plummeting from their peak in the final quarter of 2007, average rents in Dublin have since risen and risen to the point that they are now 0.2% higher than that high-water mark. In the market outside of Dublin rents are rising at a much slower pace and are still 13.9% below their 2007 peak. All these figures are up on yearly bases but the figures also show that rental increases are slowing. At a national level, rent levels rose by 0.5% in the first quarter of 2016. This is compared to a growth rate of 1.6% in the same period last year. Monthly rents for houses are now marginally lower, by 0.3% in the latest figures, while rents for apartments were 1.8% higher than the end of 2015. Despite the relative cooling of price increases, their consistent growth over the past year means that prices are significantly above what they were at this time in 2015. In monetary terms, the stats show that the average rent in Dublin is now €1,454 for a house and €1,306 for an apartment. Last year these stood at €1,342 and €1,208. Nationally, the average monthly rent for an apartments is €972 and €900 for a house. Last years these were €885 and €835. All these figures are based on actual rents paid rather than asking prices and come from new agreements signed in the first three months of this year. Email “Rents in Dublin have now smashed through their highest Celtic Tiger price level”. Feedback on “Rents in Dublin have now smashed through their highest Celtic Tiger price level”.